Part of my New Year plans included adding some more things to the "school" time that Emma and I spend together. The one on the top of my list was working on the calendar. She’s probably like most children in that the anticipation of an exciting, upcoming event drives her crazy. I especially noticed this around Christmas when I severely dropped the ball with an advent calendar. As soon as the tree was up, to her Christmas was right around the corner. The idea of waiting two more weeks was both hard to understand and simply, hard to do. So, with that in mind, I decided our New Year was going to begin with a new calendar for Emma. It’s definitely time to learn those days of the week, the months and get a general concept of calendar time. I bought this board in the office supply section at Target (and painted it). 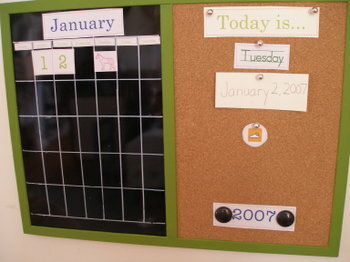 Both sides are magnetic–but it is also dry erase and cork board, so there’s lots of flexibility. 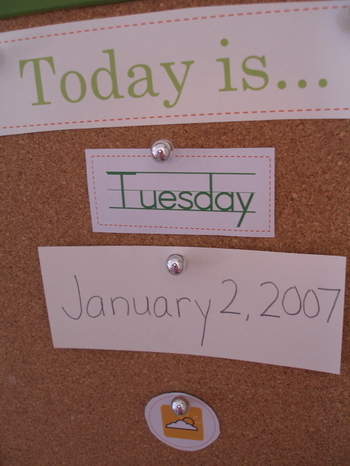 Then I made up all these calendar bits: days of the week, numbers, months, even little weather clip art. But as I was working on it, I thought, I’m definitely going to share this with all of you. It’s too much work to not pass on. So, I’m working on getting these files on here for all of you. I wanted to put them out as pdf files, but I don’t have the ability to save them that way, so for now, they’ll just be word files. But at least, you’ll be able to modify them if need be. I’m hoping this works. Let me know if there are lots of problems, and I’ll see what can be done to fix things. Enjoy. And let me know if you use them–I’d love more ideas! Great ideas! Sometimes you can get illustrator on ebay for less. Also , if you know any students, maybe you can talk them into getting you the stufent version throught their school- it is considerably less. If you have an older MAC though, and are not running OSX, the newest versions (CS) Illustrator won’t run on it. I think 8 is a great version that runs on the older operating system and that might be easier to find on ebay. If you have a newer MAC and need a copy of OSX, I have an extra unused one here that you are welcome to have. OH, thank you, thank you, thank you! I love this idea! It sure beats using poster board and card stock “laminated” with packing tape!!! That routine only lasted about 2 weeks. This is sure to be a hit.I better get on it before our Advent Calendar fever is truly over! and it is incredibly generous of you to offer up your hard work for others. YOu are so nice. what a great idea! I did this sort of thing a few years ago when I was homeschooling my oldest, but it involved a huge chalkboard that I handpainted all the squares, etc. I like your version so much more! thanks for sharing. 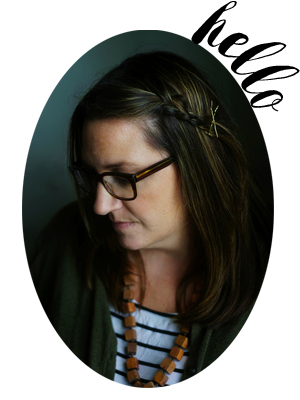 Awesome – thank you so much for sharing – I want to do this also but it has seemed like hard work – I was thinking of velcro – which I hate – but magnetic paper I have never thought of – brilliant! you are a generous girl! that must have taken FOREVER. Thanks for sharing. It really is a great idea. 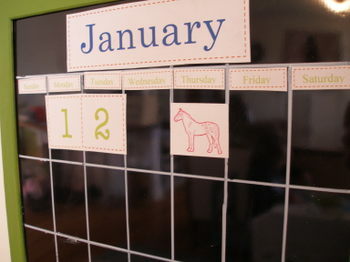 great idea – calendars are a great thing. That is really great. I have been needing to do something like that for awhile. I might just have to go do it now! Ok, so glad you posted this because I really need a magnetic board at the moment and you’ve saved me searching all over town. Target and some paint. Done 🙂 Thanks! Great idea and looks fantatstic too! wow, we must have been on the same wave length or something…I just finished up a “remodel” of our chalkboard by drawind out a 6 week calendar, labeling the days of the week with the rub-on letters that scrapbookers use, I also left space on the side and labeled an area for “groceries” and “memo”…I just use a chalk pencil to write in the dates. It really has helped my son learn the days of the week and our schedule. So generous of you to share all of the work you did! It looks great! A great project. This is going in my file when we start homeschooling. Thank you for taking the time to put this together. My 9 year old daughter has a whole room in our home devoted to her “classroom” where she “teaches” school, after school everyday. She will LOVE this!! I am going to print and laminate all of it for her. Wow, how great is that. I can’t believe you did that. What a lot of work. Thank you so much for sharing it with us. Very generous. I am definitely going to use it to make a calendar for my kids. Sorry you couldn’t convert to pdf. But good on you for sharing your ideas. Wonderful idea. Wish I could find a magentic board now… Off to search! thanks for so generously sharing these Molly! My 4 and 6 year old will have a blast cutting these out (oh, trying to let go of the straight lines is hard!) and we’ll print them on magnet paper so we can use them on the refrigerator every morning. I’d tried this with paper, but this is so much more engaging. Thanks! You must add the counters for each passing day (craft sticks, pipe cleaners, stirers, paperclips). After there are 10, they are bundled and moved to the tens place. oh molly we are so on the same track, the exact same thing happened at our house with the christmas tree. but even worse eliot’s birthday is the 29th and he asks eeeevery daaay, so we made a calendar for him. it has helped my sanity so much! Thanks so much for sharing, I really love how nice it looks! The counters idea is wonderful as well! fantastic molly! thank you so much for sharing. downloading … now! Dear Molly what a great idea! My son has one in his classroom and I would love to make one for our home. Then the girls could learn how to use it to. We are still suffering from the Christmas Fever! During December our children woke up in the middle of the night and wanted to check if Santa had been there with presents. Now especially Emma is asking every morning if it Christmas today…. I’m downloading right now so that they can see what day and month we are having right now…. Oh thank you! My girls SO wanted something like this for our ‘study’ and you’ve saved me all the work! Very nice. My daughter immediately recognized this and demanded one! Of course, here we’ll have to include weather buttons for tornados, too! And wind…lots of wind. Next Next post: do they make this for humans?